Since 2003, our passion for innovative floral design and attentive customer service has made The Purple Poppy the florist of choice for Wake Forest, Raleigh, and the greater Triangle area. The heart of our work is to spread joy through the beauty of flowers. Our designers love creating gorgeous arrangements handcrafted for each of our customers. Our network of local growers and specialty importers allows us to replenish our inventory every week so that each of our designs is filled with the freshest flowers. The Purple Poppy would be delighted to provide flowers for your next special occasion. Contact us about ordering bouquets, centerpieces, corsages and boutonnieres, gift baskets, seasonal arrangements, or silk designs. Contact us about ordering bouquets, centerpieces, corsages/boutonnieres, gift baskets, seasonal arrangements, or silk arrangements! Dedicated to providing high-quality and fresh flowers and greenery, our inventory is replenished every week. Much of our stock comes from our local growers of North Carolina, but we import a selection from all around the world. Want something extra special for an arrangement, bouquet, or your special event? Contact us and we’ll work with you to fulfill your needs! 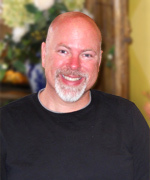 Doug’s passion for floral design began in 1984 out of a desire for art. Working in the florist business for 20 years, his vast experience and expertise has been recognized and received in homes throughout the area. In August, 2015, Doug was named the NC State Florists Association Designer of the year. In 2012, he was named Designer of the Year by the Wake County Floral Association as well as the 2011 Designer of the Year for the Northern Piedmont Florist Association.